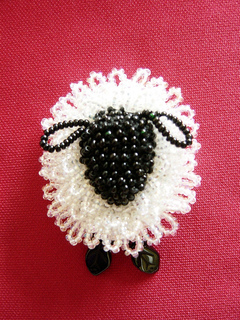 A bead knitted sheep pin looks good on a lapel or even a felted hat! Easy to knit and assemble. Technique section in pattern includes instructions for transferring beads to cotton and bead knitting. KIT SOLD OUT. The oval bead screen pin finding is no longer available. A mounting surface can be made by using 14 mesh plastic canvas. Cut a 30mm x 40mm oval of canvas. 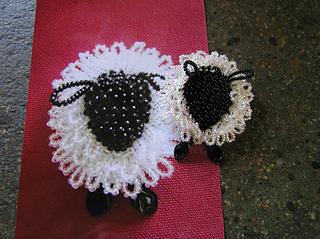 Attach pin back to canvas and mount the sheep as directed in the pattern.